Therapy dogs Willow and Rosie will be in the Roesch Library from 4-5 p.m. Monday, Dec. 10, and 4-5 p.m. Tuesday, Dec. 11, respectively, and therapy bunny Rocky will be in the library 5-6 p.m. Wednesday, Dec. 12, for petting and playing. Click here for more information about Roesch Library finals week activities. In addition to activities at the library, students also can burn off nervous energy at the RecPlex, which will be open around the clock Dec. 9-15 and offer free group fitness and yoga classes. Visit the campus recreation website for a full schedule and class descriptions. Students up late shouldn't feel anxious about their safety walking home, either. Roesch Library and Kennedy Union will offer free cab rides for students to their residences midnight to 6 a.m. Dec. 9-12. 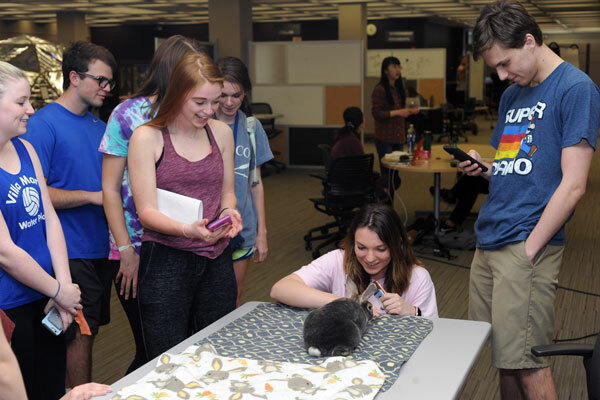 Therapy pets and similar activities and amenities have made finals week appearances at college campuses across the nation like Harvard, Yale, Denison, Illinois State, and Massachusetts. They are fun ways to de-stress, according to Linda Rodgers, counselor for the University of Dayton counseling center who has taught workshops on test anxiety. She says one of the best ways for students to combat test anxiety is to create a coping structure to support their bodies as well as their minds. "Develop a schedule and set a time to study," she said. "It's a good strategy to take mini-breaks and I'm always an advocate for exercise. Find a way to put that in as well." Get enough rest the night before. Don't do all-nighters. Know when to cut off the studying for rest, exercise or a relaxation break. Take advantage of fun relaxation breaks many schools offer — chair massages, dance breaks, therapy dogs. Make sure you eat breakfast. And don't underestimate the smell and taste of success. "Have a piece of peppermint candy in your mouth during the test," Rodgers said. "It's an interesting trick, but it works. Peppermint can slow you down a bit and relax you." Approximately 640 students will receive their degrees during the University's 169th commencement exercises 9:45 a.m. Saturday, Dec. 15, in University of Dayton Arena. A live stream of the event can be found here. The University will hold a baccalaureate Mass 5 p.m. Friday, Dec. 14, in the Chapel of the Immaculate Conception. Complete information about the University of Dayton's 169th commencement exercises can be found here. For more information, contact Shawn Robinson, associate director of news and communications, at 937-229-3391 or srobinson1@udayton.edu. Tripods are not permitted in the Chapel of the Immaculate Conception.